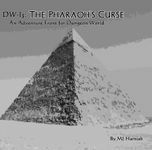 Can you survive the challenges and dangers of the ancient pyramid? Moonlight and white mist bathe a ghostly figure shrouded in ancient robes. He raises his arms toward a giant pyramid which arises in the distance. “I am the Pharaoh Amun-Ra, son of Hephetsu-re of the House of Pelar. I have been cursed to walk these sands for a thousand years, in search of a party capable of plundering my tomb and breaking the curse that binds both me and this once beautiful land. Can you retrieve my staff of rulership and break the curse?” Can you survive the challenges and dangers of the ancient pyramid?